Name dropping can be something very dangerous. When people like Tony Martin (Black Sabbath), Neil Murray (Whitesnake), Don Airey (Rainbow) and Anders Johansson (Hammerfall) are working with two less known German musicians, you expect either a really good retro rock album, or something entirely different. It may be because I don't listen to regular hard rock very much anymore, but my past experiences still make me feel when something works and when something doesn't. The first problem on this album is - in my opinion - Tony Martin, who did a really great job as Black Sabbath vocalist in the late 80s. Compared to Sabbath, this album is only warm air. 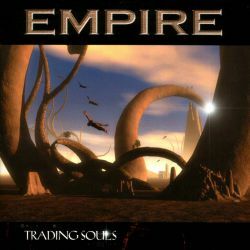 Rolf Munkes, German guitar player and mostly responsible for Empire, must know influential people to get such a line-up together, but it is truly disappointing to listen to Trading Souls. Munkes, who is rooted in classical progressive rock, manages on this record to sound neither progressive nor rock, but rather as if he's comfortable with melodic AOR that would have fitted perfectly into an episode of Miami Vice. Sure, it's professionally done, but I miss that spark you get from bands that work together out of pure fun. I don't know if this album was fun to make for those involved, as I wasn't in the studio when they recorded it, but it sounds like they made it more out of professional obligation than out of motivated idealism. Just to show you why: all songs have more or less the same playing time, like the longest song is only 43 seconds longer than the shortest one. Coincidence? Maybe, but still... This is an album I can only recommend to those who listen to extremely melodic mainstream metal, and that's a fan basis shrinking more and more. 3 meagre points.